There will always be those flavors that you can't get enough of. Take salsa, for instance. You combine spicy garlic, diced jalapeno, onion, juicy tomato, and fresh cilantro with a pinch of salt and cumin to make an irresistible combination. Salsa music is a lot like that! Talented musicians combine staccato percussion, snare, guitar, and horn music. How can you resist stomping and shimmying along to that music? Once you get a taste you go back again and again. Get into the salsa sensation with this sleek, black wig. No need to wrestle your hair into that perfect parted bun when you've got ahold of this gorgeous wig. A strand of hair curls from the part with tight strands swept into the bun. 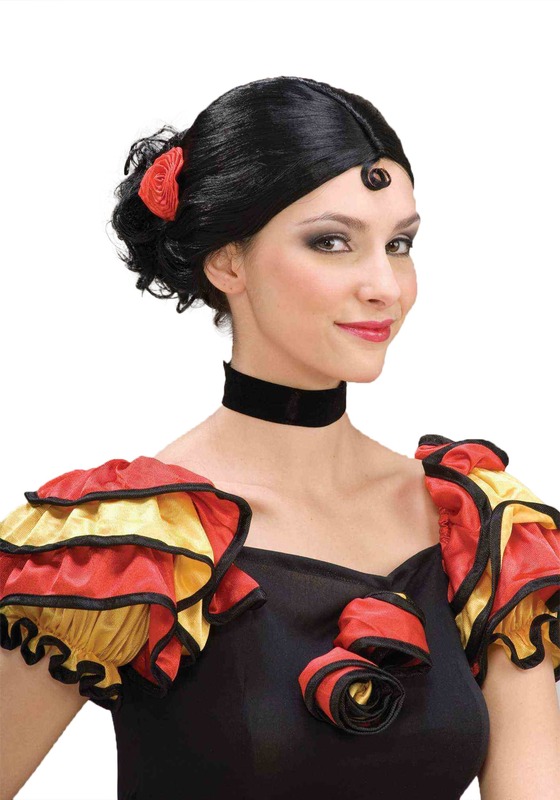 A rose is placed by the bun to bring your wig together with a salsa costume. When you're getting into a salsa state of mind, there's no use trying to stay subtle. Embrace bright colors, dramatic poses, and bold dance moves. In one of our many Spanish inspired costumes, you won't want to hold back. With fresh colors and plenty of flavor, you won't want to give up this look any time soon!